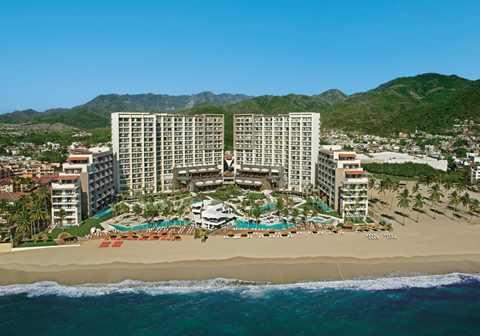 Secrets Vallarta Bay Puerto Vallarta is situated on the golden sand beaches of the Banderas Bay, just minutes from the famous El Malecón boardwalk. 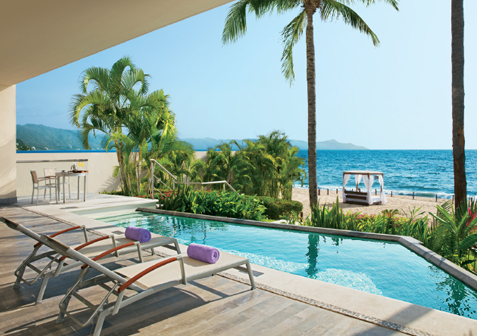 This adults-only getaway offers Unlimited-Luxury® privileges, including limitless gourmet dining and top-shelf spirits, daily activities, live entertainment, and Unlimited Connectivity – offering free Wi-Fi and free calling to the U.S. and Canada. 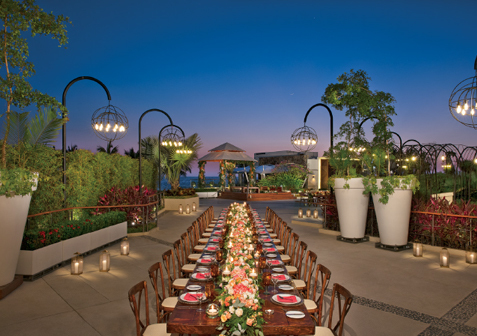 Guests even have the privilege to visit nearby participating resorts with the Sip, Savor & See Dining Experience. All 271 spacious suites offer remarkable ocean views, contemporary décor and refined luxury amenities including daily refreshed mini-bar and 24-hour room service. 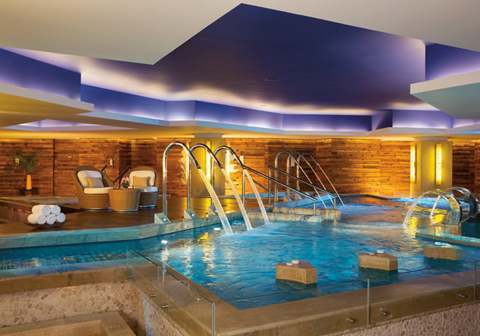 Relax at the world-class Secrets Spa by Pevonia® or hit the green with complimentary greens fees at nearby golf courses. Additionally, all guests have free flow access to seven restaurants, five bars, and facilities at nearby Now Amber. Do it all or do nothing at all at this romantic hideaway. 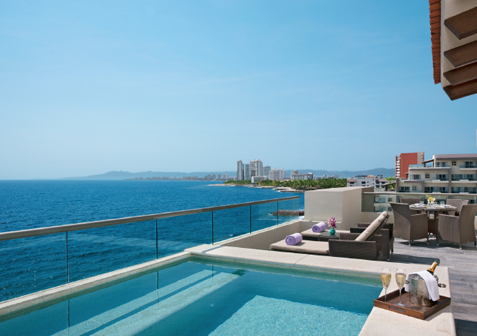 Secrets Vallarta Bay Resort & Spa offers 271 spacious suites, with stunning ocean views, beautiful contemporary Modern décor, marble floors, and lush gardens. Spacious and luxurious Junior Suite features all above the above amenities, plus one king size or two double beds and balcony with beautiful garden views. These suites are fully equipped with separate shower, soaking tub and double vanity sinks. These suites are located on the 2nd and 3rd floors at the main tower. 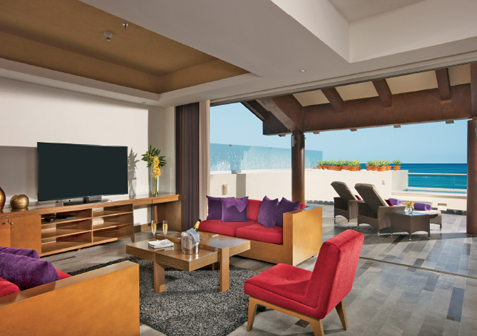 Spacious and luxurious Junior Suite features, in addition to the above amenities, one king size or two double beds and balcony with beautiful ocean views. These suites are fully equipped with separate shower, soaking tub and double vanity sinks. These suites are located on the 3rd and 8th floors at the main tower. Spacious and luxurious Junior Suite Swim-Out feature all of the above amenities, plus one king size bed and balcony that opens to a magnificent direct pool access. These suites are fully equipped with all of the above amenities, plus separate shower, soaking tub and double vanity sinks. These suites are located on the ground floor in the main tower. *Only available in the UK and Mexico markets. Located in the Secrets Preferred Club Tower these 661.67 sq. 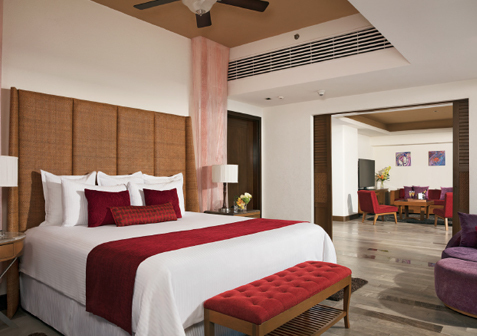 ft. suites offer, in addition to the above amenities, one king size bed. In addition to the above amenities, a private terrace with breathtaking garden views and Jacuzzi. Bathroom is fully equipped with in room soaking tub, separate shower and double vanity sinks. These suites are located on the 2nd and 4th floors in the Preferred Club Tower. Located in the Secrets Preferred Club Tower, these 661.67 sq. 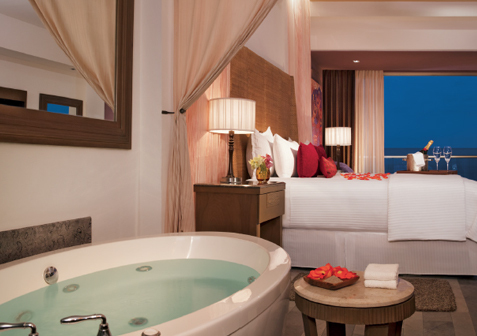 ft. suites offer, in addition to the above amenities, one king size or two double beds and private terrace with breathtaking ocean views and Jacuzzi. Bathroom is fully equipped with in room soaking tub, separate shower and double vanity sinks. 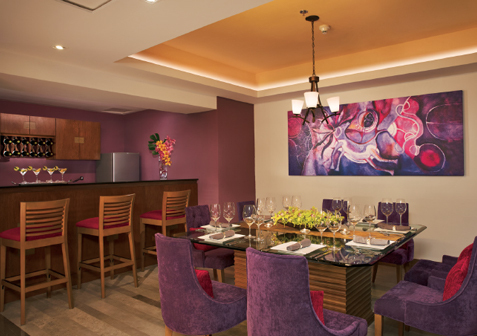 These suites are located on the 4th and 8th floors in the Preferred Club Tower. Located in the Secrets Preferred Club Tower these 661.67 sq. 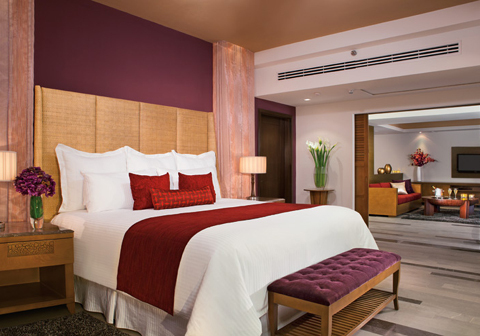 ft. suites offer one king size bed. In addition to the above amenities, a private terrace with breathtaking garden views and private access to pool. Bathroom is fully equipped with in room soaking tub, separate shower and double vanity sinks. These suites are located on the ground floor in the Preferred Club Tower. At a preferred location in the Secrets Preferred Club Tower, these gorgeous 1230.57 sq. ft. suites offer all of the above amenities, a king size bed, spacious separate living area, refreshing private Jacuzzi and solarium with direct access to one of the pools that flows to each private patio. Full bathroom with separate shower and soaking tub. These suites are located on the ground floor in the Preferred Club Tower. At a preferred location in the Secrets Preferred Club Tower, these gorgeous 1230.57 sq. 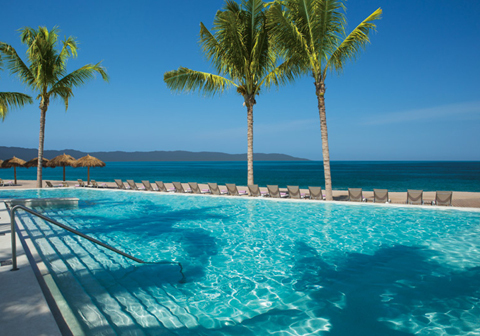 ft. suites offer, in addition to the above amenities, a king size bed, spacious separate living area, refreshing private Jacuzzi and solarium and full oceanfront view. Full bathroom with separate shower and soaking tub. 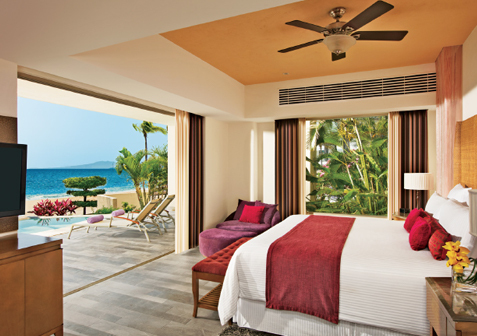 This suite can be connected to a double bed Preferred Club Junior Suite, Garden or Ocean, depending on floor of preference, to create a two-bedroom suite. These suites are located on the 2nd and 7th floors in the Preferred Club Tower. At a preferred location in the Secrets Preferred Club Tower, these gorgeous 1230.57 sq. 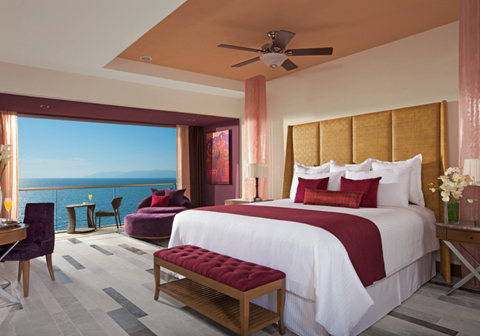 ft. suites offer a king size bed, spacious separate living area, refreshing private Jacuzzi and solarium with direct access to one of the pools that flows to each private patio and full oceanfront view, in addition to the above amenities. Full bathroom, with separate shower and soaking tub. This suite can be connected to a double bed Preferred Club Junior Suite Garden to create a two-bedroom suite. This suite is located on ground floor of the Preferred Club Tower. Located at a preferred location in the Secrets Preferred Club Tower, these magnificent 1829.92 sq. ft. suites offer a king size bed and spacious separate living area fully equipped with home theater & 40” Plasma TV and personal bar, in addition to the above amenities. 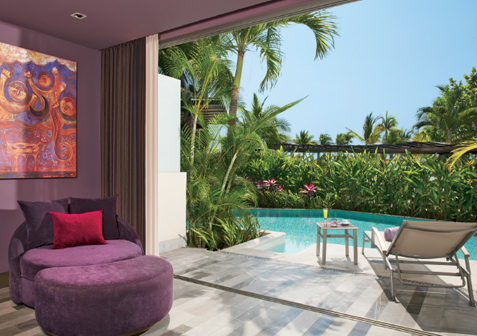 Head outside and enjoy a refreshing private plunge pool and patio with solarium. 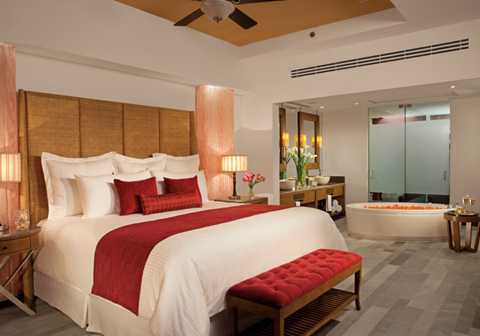 Experience spacious dressing areas, walk-in closet and full bathroom with ocean view bath, bidet and Jacuzzi. This suite can be connected to a double bed Junior Suite to create a two-bedroom suite. Featuring superior amenities including kitchenette, fridge, microwave, telescope and more. This suite is located on the 8th floor of the Preferred Club Tower. 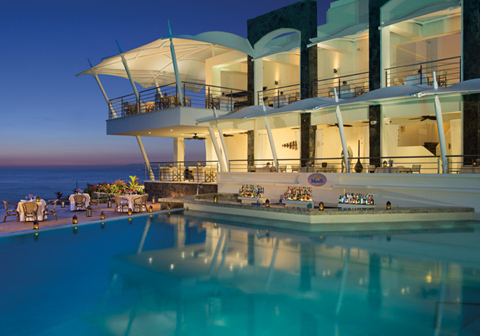 Offering 5 dining options including 1 buffet, 2 à la carte restaurants, 1 grill and 1 café with no reservations required. 24-hour dining options allow guests to enjoy late night bites at Coco Café. Or guests can stay in and order room service. It’s all available at any hour day or night. All restaurant openings rotate throughout the week. Number of restaurants open for each meal is dependent upon occupancy level. Gluten free and vegetarian options available upon request. Bordeaux | Dinner 6:00 p.m. – 11:00 p.m.
Bordeaux’s wine cellar offers a semi-private dining section that can accommodate up to 42 guests. The warm and romantic atmosphere provides a unique dining experience with an extensive wine list – perfect for special occasions. Additional costs may apply. Market Café | Breakfast 7:00 a.m. – 11:30 a.m., Lunch 12:30 p.m. – 3:30 p.m., and Dinner 6:30 p.m. – 10:30 p.m.
Oceana | Lunch* 11:30 p.m. – 5:00 p.m., Dinner 6:30 p.m. – 11:00 p.m.
*Lunch is for Preferred Club guests & UVC members only between the hours of 12:00 p.m. to 4:30 p.m. The Bay Café | Open 6:00 a.m. – 10:00 p.m.
Capers | Dinner 6:00 p.m. – 11:00 p.m.
Carnival | Breakfast 7:00 a.m. – 12:00 p.m., Lunch 1:00 p.m. – 4:00 p.m., Dinner 6:30 p.m. – 10:30 p.m.
Castaways | Lunch* 12:00 p.m. – 4:30 p.m., Dinner 6:30 p.m. – 11:00 p.m.
Tamarindo | Dinner 6:00 p.m. – 11:00 p.m. The Chef’s Table offers an intimate, unique dining experience. Featuring an open kitchen, guests will have a front row view of the chef preparing their dishes. Additional costs may apply. Formal – For men: long pants, collared shirts, and dress shoes. For women: blouses, skirts, slacks or dresses and dress shoes. Casino 52 (Coming 2018) | 11:00 a.m. – 1:00 a.m.
Manatees | 10:00 a.m. – 6:00 p.m.
Rendezvous | 10:00 a.m. – 1:00 a.m. Preferred Club Bar | 7:00 a.m. – 11:00 p.m.
Smoothie Bar | 8:00 a.m. – 12:00 p.m.
Sugar Reef | 10:00 a.m. – 7:00 p.m.
As part of the privileges of Unlimited-Luxury®, we’re offering guests of Secrets Vallarta Bay the chance to Sip, Savor & See at Dreams, Now and Sunscape. 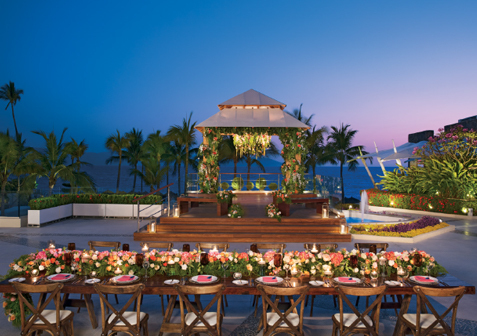 Enjoy dinner and live entertainment at participating sister properties including sipping complimentary cocktails, savoring delicious cuisine at the restaurant of your choice and the opportunity to see that evening’s entertainment. 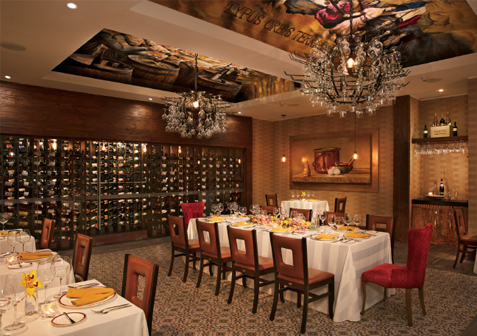 The Sip, Savor & See Dining Experience is only good for dinner at a qualifying sister resort. This is not a day pass. 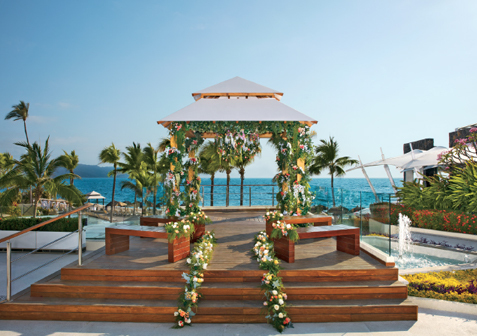 Guests must make arrangements through the concierge before 3 p.m. 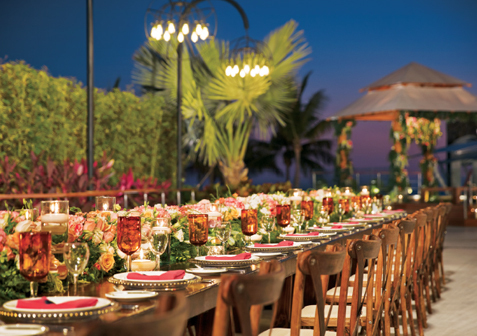 Guests may choose to dine at any of the restaurants that are serving dinner with the same policy of “first come first serve.” Guests are responsible for cost of transportation to and from the resort. A maximum of 4 people are allowed per seating and the reservation is subject to the availability of the resort to visit. Special restrictions may apply for Christmas and New Year’s Eve dinners and special events. Guests can utilize the facilities at the resort they are visiting from 6 p.m. to 1 a.m., including bars and theater. From El Malecon until the Sierra Madre Mountains, each one of the Puerto Vallarta’s attractions will captivate your spirit. Go shopping in the multi-color markets; walk through the downtown and enjoy typical foods, admire the beautiful sculptures and visit historic places like the Guadalupe Church and The Arcs. Take an excursion to the native town and enjoy the dances and pilgrimages honoring the Saints; climb up the majestic mountains and into the rainforest; or simply enjoy the amazing beaches along the Banderas Bay. Whale Watching – Whale watching season in Puerto Vallarta begins in early December and ends in late March. Vallarta Adventures – One of the most exciting attractions in Puerto Vallarta that allows guests to swim with dolphins and sea lions. Located just 12 miles from the resort. Guadalajara and Tequila – Tour one of the dozens of tequila distilleries starting in Guadalajara and ending in Tequila. Sport Fishing/Open Water Diving – There are local open water diving facilities and courses as well as a fishing pier and charters available for world-class sport fishing. Eco-Adventure Tours – There are numerous tours available including outdoor adventure tours, canopy tours, zip-lining, water sports, hiking and more! Los Arcos National Park – This popular dive site is located in Puerto Vallarta and includes a unique underwater park featuring excellent views of tropical fish. Only 8 miles away. Guests of Secrets Vallarta Bay Puerto Vallarta can enjoy one complimentary round per person, per day when staying now through June 30, 2018 at Marina Vallarta Golf Club & Vista Vallarta Club de Golf. There are additional fees that guests are responsible for at the golf course. Details & pricing can be found on the Special Offers page under “Complimentary Greens Fees” offer. 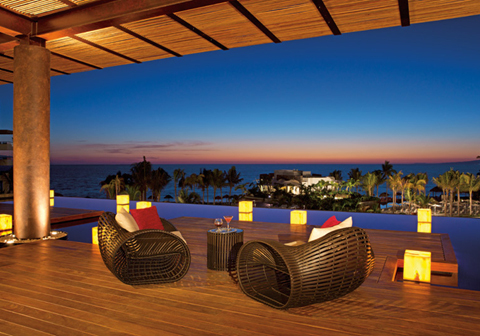 Step inside our luxe members-only U-Lounge, next door at Now Amber Puerto Vallartal! You'll get to enjoy special amenities including a lounge area, light beverages and snacks, complimentary internet access, books, DVD rentals and more. Your dedicated Member Services Executive there to help you reserve your Amstar or resort services, make payments or future reservations and so much more! 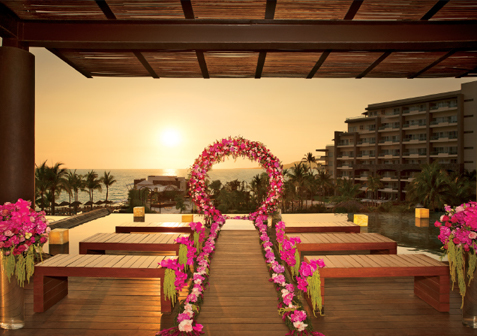 Guests at Secrets Vallarta Bay Puerto Vallarta can stay connected for free! Download the free Secrets Resorts and Spas app on your smartphone, tablet, or mobile device to place calls* and send messages over the hotel’s WiFi network without incurring international cell phone roaming charges. Plus, create user profiles, keep up with social media, use your room phone remotely, contact staff directly, tailor personal deal preferences, book spa appointments, reserve excursions and much, much more. The app makes hotel information mobile – you're only a click away from information about dining, amenities, resort activities, local attractions and more. It's the perfect travel companion that allows you to enjoy your vacation...connected. 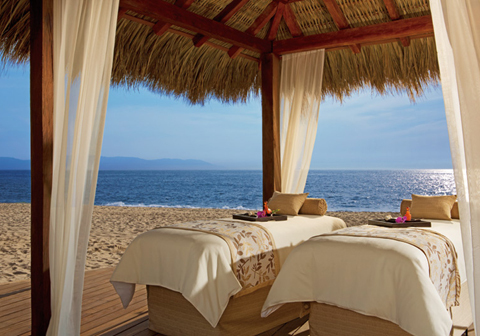 Secrets Vallarta Bay features world-class spa services and amenities offering the ultimate in pampering, including among others, soothing massages and indigenous treatments, Jacuzzi baths, relaxation lounge, sauna & steam cabins and cabanas, Swiss shower, hydrotherapy circuit, beauty parlour and more! 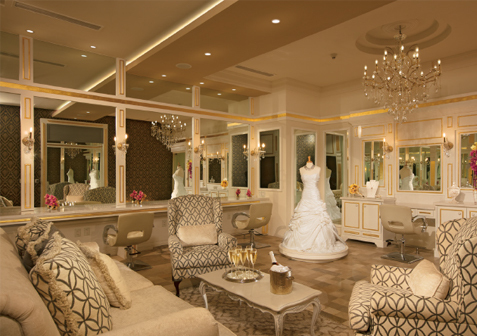 Come and let us pamper you. 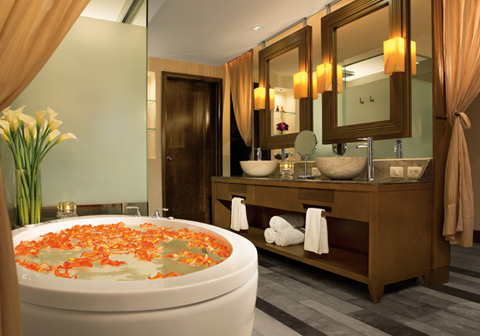 The new Serenity Spa cabins located provide guests with an open, sensory spa experience. The modern, palapa-style cabins offer views of tropical gardens through their glass panel walls. With a special treatment menu inspired by the Hindu medicine “Ayurveda” or “the science of life,” guests will find physical balance and serenity. 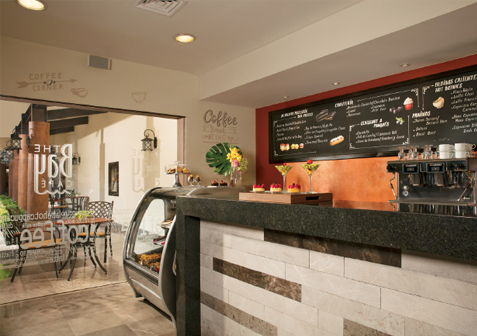 A refreshment bar with fresh fruit and natural infusions at the spa.